Bananas are perhaps one of the nature’s most under-rated fruits. The yellow skinned fruits are easy to overlook, especially when it seems as if there’s always some new and exotic type of fruit that’s being touted as the next big thing. However, the fact remains that bananas are a tasty super food that can give our bodies all the good stuff it needs to thrive. They’re packed full of nutrients, vitamins, fiber, and all-natural sugars, like sucrose and fructose. That’s part of the reason why eating bananas regularly can help to keep the doctor away. Bananas are delicious, but most of us tend to throw them away as they form brown spots or eventually turn completely black as they get very ripe…big mistake! 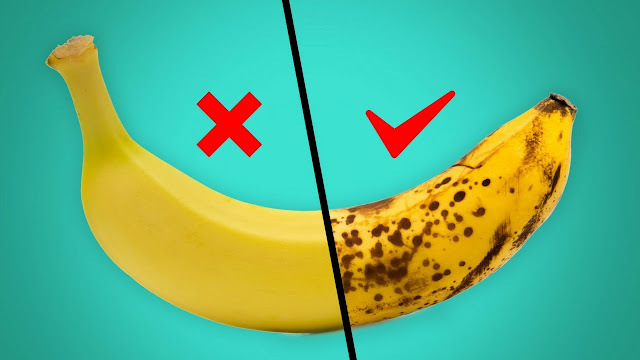 As it turns out these brown spots, as you will hear in the video you are about to watch below, turn bananas into a SUPER FOOD! Not only do the dark patches on Bananas increase their amount of cancer-fighting antioxidants, the riper bananas have other incredible properties that benefit your body! 1. Bananas can banish an upset stomach. By stimulating the coating mechanism in your stomach lining, bananas shield you from the acids that cause heartburn and upset stomachs. 3. Below the stomach, bananas help you digest. With their high fiber content, they'll also help you manage your cholesterol level – and brown bananas are even easier to digest than yellow bananas. 4. Just one banana can reduce PMS symptoms and prevent morning sickness. It's thank to vitamin B6, which also helps cognitive functions and reduces risks of certain cancers. 5. Eating bananas can help keep depression at bay. Tryptophan, magnesium, and of course some sweetness will calm your brain and lower your anxiety. 6. Bananas help prevent colds. It's not just citrus fruits that pack in vitamin C; bananas have plenty too, and it also reduces inflammation and slows the aging process. 7. And they can stave off asthma too. In a victory for respiratory wellness, kids who eat a banana a day display fewer asthma symptoms than those who eat a little fruit. 8. Bananas are brain food. Our brains crave carbohydrates, potassium, vitamin B6, and magnesium – all of which bananas contain. 9. Bananas get your metabolism in gear. The key nutrient at work is manganese. Research shows that diets with sufficient manganese lower rates of stroke, heart attack, osteoporosis, and more. 10. That also makes bananas an ideal source of energy before exercise. The potassium reduces muscle fatigue, and dietary copper helps stimulate red blood cell growth. And brown bananas contain more sugar, which means more energy so you can do crunches in bunches.